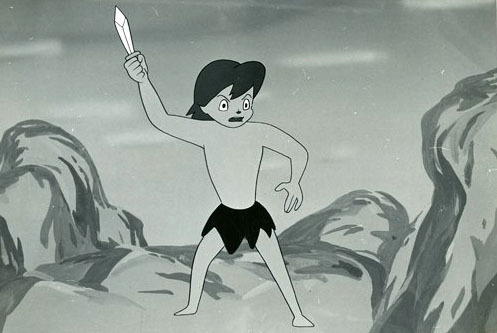 When Astro Boy debuted on New Years Day, 1963, the Japanese animation industry was forever changed. The animation industry in Japan was always small compared to America’s, but once television came into the picture, the industry practically grew overnight. Soon more studios began to spring up wanting to get into the business. Toei Animation, however, wasn’t a new studio, having been around since the 1950s producing high quality theatrical films. Realizing that TV is there to stay, they decided to embark on the challenge of producing weekly cartoon episodes for the now-expanding medium. 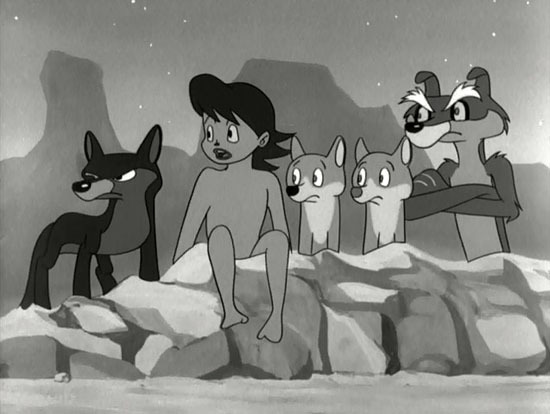 Their first made-for-TV cartoon, Ookami Shonen Ken (Ken the Wolf Boy), premiered less than a year after Astro Boy first made airwaves. Here we have a cartoon starring a human boy that’s literally raised by wolves. 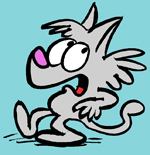 Ken is an orphan that was discovered by a group of intelligent wolves in the Himalayan region. Similar to Tarzan of the apes, Ken grew up with the wolf pack, learning of their ways and surviving the wild with them. Ken is regarded as one of the wolves by the others, but he was distrusted by Jack, a one-eyed wolf, who despised humans (he lost one of his eyes because of them). Jack, however, had a change of heart when Ken saved him from a trap. And thus he finally became allies with him. In addition to Jack, Ken also interacted with a pair of twin wolves Chicchi and Poppo, who frequently get into mischief. Ken acts as their surrogate older brother, having to constantly watch over them. The wolf pack is led by Boss, an eccentric leader and the brains behind the group. Boss is assisted by Black, a cowardly, nervous wreck of a wolf. The episode stories can be dramatic. Characters get into real danger often times, like in the first episode, where Ken, while asleep, was almost bitten by a poisonous snake. Jack contemplated on whether he should save him, questioning his dislike of humans after Ken saved his life. In the end, Jack kills the snake and saves Ken, leading him to grow as a character. However, whenever things get too heavy, it’s off-set by slapstick comedy. Twins Chicchi and Poppo act as comedy relief, the two playing off each-other for fun, but there’s also Black as well, being known to overreact, much to the leader of the pack, Boss. The cartoons are primitive by today’s standards, but one can see the appeal the show had on viewers back when it was airing. 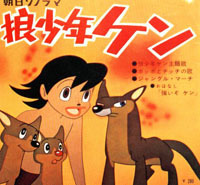 Wolf Boy Ken served as a training ground for the young Isao Takahata, who got his feet wet directing several episodes of this show, and Hayao Miyazaki, who worked as an inbetween artist, his first job in animation. The show aired on the NET network from November 25, 1963 to July 12, 1965 for 86 episodes. As with most Japanese shows of the era, it was filmed in black and white. The important thing, though, is that it proved to Toei Animation that there is a market for television cartoons. After Ken, they began producing more and more shows for television, ranging from Pyun Pyun Maru to Dragon Ball to One Piece. They’re still in business today, one of the oldest animation studios in the country, producing TV cartoons and feature films with no end in sight. Recently Toei released the entire run in three DVD box-sets. 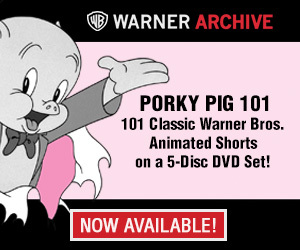 Good to see that the studio hasn’t forgotten about its television roots. Although only the pilot episode dubbed in English was available in America, I have been assured that all 86 episodes in English were shown on Australian TV in the 1960s. Did Butler and Messick dub the entire series, or were the other 85 episodes dubbed by someone else just for Australian TV? I did sorta wonder that Fred if it was a US cast or an Aussie one for that. I suppose we’ll never know unless a 16mm print of an episode gets found down under for us to see someday. Noticing the English version, it looks like it was copyright to “MCA TV”, I wonder if whatever’s left of that pilot is still within NBC-Universal’s collection these days alongside Calvin and the Colonel. Boss (the one on the right; presumably that’s who he is) bears a not-altogether-coincidental resemblance to Wile E. Coyote, I would say. I wonder what kind of voice would Daws or Don give that character? Kinda fun watching that brief clip and picking them out! Fred’s right, as I’ve seen TV listings for a station in Sydney which aired them. So someone had to have dubbed the whole series, unless subtitles were used. I’ve seen ken collectibles for sale from Australian sellers, so they most likely had the series. Nice to know some countries got lucky with shows like this. Australia also dubbed a few as well like one of Sunrise’s earliest shows called “Kum Kum”. thanks so much for this informative and entertaining post! I recently purchased the 3 ken box sets, but hadn’t gotten around to watching them. I’ve been watching some of the toei theatrical cartoons — doggie march, and the prince and the 8 headed dragon. I was going to watch Gulliver’s travels beyond the moon today, but your post inspired me to instead watch the first 3 episodes of ken. your were spot on when you said that ken has a much lower quality of animation than toei’s theatrical cartoons. I was surprised at the level of quality, especially after watching the hustle punch cartoon that you posted here. do you have any idea why the quality of hustle punch was so much better than that of ken? despite its weak points, I really loved this cartoon. it took me back to my childhood, watching astro boy, kimba, and speed racer with my sister. I wish we could have watched ken as well (but not with messick and butler doing all the voices like in that pilot. yeesh, i’ll take the original voices any day — even without subtitles like on the dvds). speaking of voices, the actress that voiced popo, did she do a lot of animation voice work? her voice sounded familiar, or was it just that a lot of actresses imitated her voicing of children? also, here’s a life size statue of ken. it looks like its something newer-made. was it perhaps a promotional piece for when the dvd box sets came out? Being it was the first, I wouldn’t be surprised simply because they hadn’t quite figured it out yet. They were probably following Mushi Productions’ lead there. They figured that’s all you had to do, but they certainly learned after it. I could understand what that was since they were still new to that medium. That looks like something I’d imagine Toei having at their studio you might spot during their tours. I know a few guys who went on them! @ Chris Sobieniak – thanks for sharing that link to the toei studio museum visit! that is one incredible place. maybe we should all get together and go there on a group get together! was it ever specified where this story takes place? it has quite a mish-mash of flora, fauna, terrain, and indigenous people. The first 26 episodes of the series were dubbed into English and aired here in Australia in its various local markets around the country. Here in Adelaide it was first seen in March 1967, replacing “Fireball XL5” in the 400pm timeslot on Channel 7. I caught the program from the start, because I’d been an avid viewer of “XL5”. It should be noted that the order of the episodes of “Ken” as aired here did not match the Japanese order, (for example the first episode aired was not “Wolf Boy Ken”, but “Tamatan, The Witch”). I know that it aired at least 3 times here on Channel 7 up until it’s last Adelaide metro run in 1973/1974, as well as airing in both Melbourne and Sydney. It also aired in regional markets, with country viewers here in South Australia able to see it at various times throughout 1971.